It is now a deadly weapon in Mario Kart and a slapstick comedy staple, but how did the banana peel gets its reputation as such a threatening object? Whether or not people frequently slipped on the rotten skins, the banana peel came to symbolize poor manners. Around 1880, Harper’s Weekly admonished anyone who tossed their banana peels on a public walkway, as this would likely result in broken limbs. In the book Bananas: An American History, author Virginia Scott Jenkins describes how Sunday Schools warned children that an improperly discarded peel would not only definitively lead to a broken limb, but that the person with the broken limb would inevitably end up in the poorhouse due to this injury. In 1909, the St. Louis city council completely outlawed “throwing or casting” a banana rind on public thoroughfares. Today it’s quite rare to see a discarded banana peel on the sidewalk, but it is still ingrained in most Americans the perils of crossing paths with one. 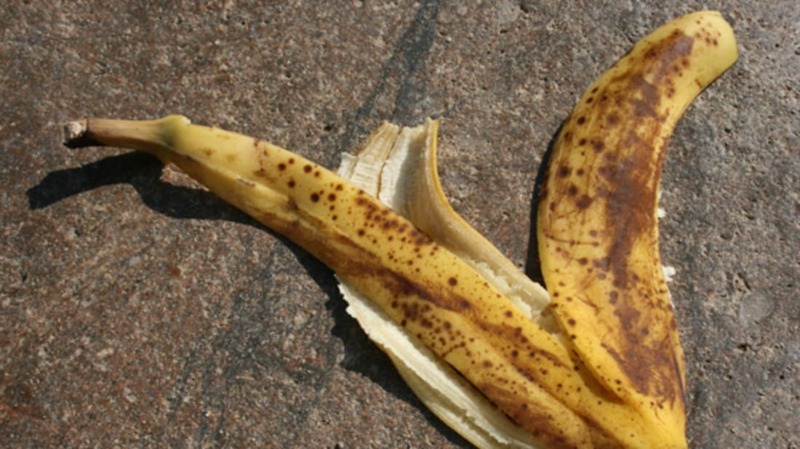 Since the beginning of the 20th century, slipping on a banana peel has been a fixture in physical comedy. The slipping-and-falling gag is widely accepted to have originated on the Vaudeville stage. The AV Club points to Vaudeville comedian “Sliding” Billy Watson – not to be confused with competing Vaudevillian Billy “Beef Trust” Watson – as the self-proclaimed inventor of the banana-peel pratfall. Supposedly, Watson witnessed a man struggling to maintain his balance after slipping on a peel. This inspired the “sliding act” which brought him great fame in the 1900’s. Vaudeville comedian Cal Stewart often told many banana peel jokes as his copyrighted stage persona “Uncle Josh.” A 1903 recording of the bit “Uncle Josh in a Department Store,” features many references to banana peel-laden sidewalks. The gag first appeared on the silver screen in the Harold Lloyd silent film The Flirt. While sitting in a restaurant, Lloyd’s character diligently peels a banana then tosses the skin on the floor. A snooty waiter walks by with a full tray, slips and falls. Chaos ensues. Buster Keaton heightened the gag in his film The High Sign (1921). Walking down the street, Keaton encounters a banana peel on the sidewalk. He proceeds to walk over it, but contrary to the audience expectation, he does so totally unharmed. Keaton puts his hands to his mouth and mocks the peel, only to slip on a second peel he didn’t see. Though the traditional gag became very commonplace in silent cinema, comedians continued to find ways to improve the wheel, if not reinvent it. In their 1927 picture The Battle of the Century, Laurel and Hardy use the banana peel trick as an impetus for a full-scale pie fight. The silent film era may have cemented the comedic potential of an improperly discarded banana peel, but the gag has continued to hold a place in popular culture to this day. Even Woody Allen fell victim to the slippery effects of an oversized peel in his early film Sleeper. In the 1800’s, a banana peel achieved its gooey state only after several days or weeks of rotting. However, the gag proposes a freshly peeled banana skin is equally threatening. Back in 2009, Discovery Channel’s Mythbusters decided to test the slipping-on-a-banana-peel theory. In their experiments, a singular banana peel did not yield any slippage. However, when they filled a concrete surface with many different banana skins, Mythbuster Adam slipped a total of 6 times in one minute while trying to traverse the peel-covered surface. While this particular experiment confirmed banana peels are indeed slippery, it did not guarantee that stepping on a banana peel would definitely lead to a fall. Thus the myth was considered disproved. How Stuff Works proposed that friction determines the actual likelihood of one slipping on a banana. The less friction between a foot and the peel in question, the more likely one is to slip. The author points out that the soles of today’s shoes are designed with risks like these in mind. So the likelihood of you actually slipping on a banana is pretty slim. However, TV Tropes noted that in 2001 Great Britain reported over 300 banana-related mishaps – the majority due to peel-slipping. In 2011, a woman in California sued a 99 Cent Only store in which she suffered a herniated disk from allegedly slipping on a banana peel left in the middle of an aisle. So remember, if you ever encounter a freshly shed peel in your path, it’s probably harmless. Then again, if you want to avoid becoming a punch line, it’s probably best to sidestep it.